This week I honor those who lost their lives in the Newtown shooting and to bring things back into a positive note I talk about ways to share photos and to create slide shows. ~ Animoto of my girls going to the north pole. Google has made a lot of new improvements over the last few weeks and I talk about how they can benefit education. I also cover some new ways to subscribe to the show. ~ Fusion Tables Available for Google Apps ~ Examples ~ thank you Jeff Wallis for finding them. ~ Please let me know how you are using fusion tables with your students. This week we interview Troy Cockrum of the Flipped Learning Podcast. Troy is a Google Certified Trainer and Certified Trainer. He teachers Middle School Language Arts teacher at the St. Thomas Aquinas School in Indianapolis. We talk about flipped learning as well as how Troy is using 20% time in his classroom. John Sowash is a high school teacher and the Director of Online Learning for Global Christian School Online. John is a Google Certified Teacher and Trainer and enjoys providing inspirational professional development training for schools and businesses. You can connect with John via his blog (http://www.electriceducator.com) or Twitter (@jrsowash). ~ MOOC's (Massive Open Online Course) Good or Bad? ~ What's your opinion of MOOC, is it good for edu or bad for edu, for PD. This week I talk about Google Plus and how as of 5 minutes before I went to record it is availible to K-12 schools. ~ Google+ Now available to k12 - Same TOS as Google's non-core services, so it should be shut off for students under 13. ~ Vault for Apps and Gov. ~ Questions for Flipped Ed episode with Troy Cockrum being recorded Nov 30th? ~ Renamed my Twitter name from AskBj to EdListen. George teaches a Current Events class which we are starting a student podcast with the class. We are not experts in creating a student podcast but rather we are sharing our experiences. ~ Let us know of any non mainstream news. Andy West and Bjorn Behrendt talk about the new $249 Chromebook and upcoming conferences. Profé and I talk about teaching foreign language in high school and some of the new tools you can use. ~ Welcome to the new EdListen Podcast I will be recording every Friday at 3:00 est. Note: After I recorded the show I figured out that when you have the virtual keyboard open it actually changes layout of your physical keyboard. This means you don't need to type using the virtual keyboard, but you can use your normal keyboard to type just replace the keys with what you see on the virtual one. Let me know your favorite places to connect with other educators in other countries. If there are any English teachers in a Spanish speaking country please contact Profé and me. 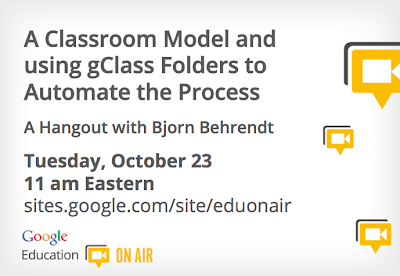 I will be presenting my Google Apps Classroom Model and my script gClassFolders which creates the students folders for you. Episode 5 ~ What Phone Should I Get?